The Narrative Lectionary points us to Matthew 25:31-46 this week. It is the final sermon in my four-part series called Surprise Endings. This parable does not begin with the familiar “The Kingdom of Heaven is like…”, leading some to believe it is not a parable at all but a description of what the final judgment of humankind will look like. Yet, it does have some elements that make us think it is a parable. It has that almost private conversation with Jesus and a few of the sheep and a few of the goats. Whether it is a parable or a teaching, the point will not be lost. Everyone except Jesus in this text is surprised and asks the same question: WHEN? “But when the Son of Man comes in his glory, and all the angels with him, then he will sit upon his glorious throne.32 All the nations will be gathered in his presence, and he will separate the people as a shepherd separates the sheep from the goats. 33 He will place the sheep at his right hand and the goats at his left. It’s hard to picture what this might look like – an enormous crowd bigger than any we have ever seen is gathered. They are before the Lord on his throne and all the angels are there. The spectacular glory of Jesus in this text is beyond our imagination. There is a separation here, sheep and goats. He first speaks to the sheep, and welcomes them with warmth and appreciation for the way that the ministered to Him. In the second section he rebukes those who did not minister to Him. In both cases the people want to know one thing. WHEN? One can only imagine how they felt. Have you ever unknowingly done the right thing and gotten credit for being smart or intuitive or merciful? More likely we’ve been in the goat camp, thinking we’ve got the bases covered but didn’t get the job done. There seem to be seven categories of service listed here, to which we should give attention. I’m going to go out on a limb here and guess that every Christian, if they were to see Jesus himself in one of those conditions, would sacrifice anything in order to minister to him. Who would withhold food, drink, care, clothing, or compassion from our Lord? That’s what the sheep wanted to know. WHEN? The goats wanted to also know WHEN did they miss the opportunity? The answer of Jesus is actually chilling. 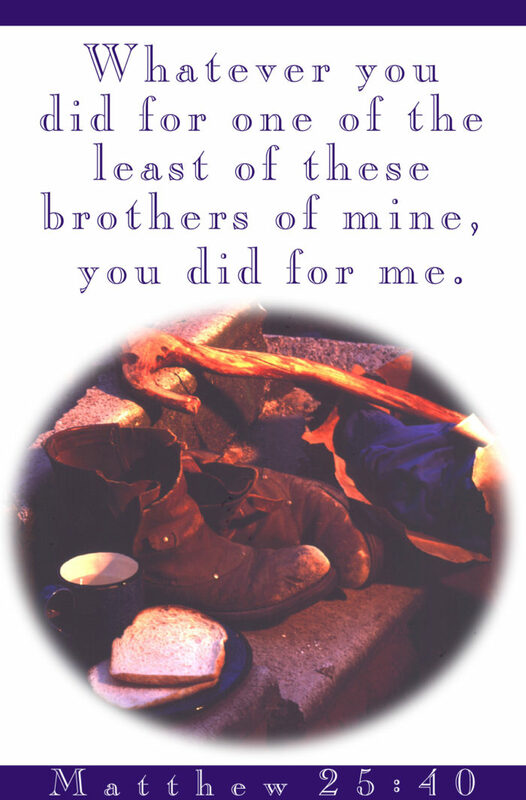 I tell you the truth, when you did it to one of the least of these my brothers and sisters, you were doing it to me. And it was also true, “when you refused to help the least of these my brothers and sisters, you were refusing to help me” (vs. 45). I don’t know many people who can read this without some serious introspection, myself included. There is never a sense of ‘how much’ here, is there? This is not about reaching a quarterly goal. It’s about our lifestyle as followers of Jesus. The consequences are eternal … punishment or life (vs. 46). So I think it is a good time to ask ourselves WHEN. When have we ministered to Christ today? I would add that I do not think these seven categories are exclusive … whenever we act in compassion and love toward those we might consider “least of these” we are doing so to Jesus Christ. And I do think our churches could ask this question. But if our churches are doing good ministry but we are not personally involved, we might question if we are to be categorized as a sheep or a goat? This comes down to loving Jesus. When we love Jesus we listen when he tells us the two greatest commands are to love God and love neighbor as self. There is an eternity in the balance. And there is no third category. So, if you are convicted that you ought to do more loving Jesus BY loving your neighbor, then only one question remains. It’s not HOW. The remaining question is WHEN? Since we just studied the parable of the bridesmaids who were left out of the banquet because they foolishly did not bring enough oil for their lamps … we know that we do not have an unlimited time to serve Jesus. Is Jesus hungry, thirsty, naked, sick or imprisoned somewhere within your reach? Would you love to serve Him? You’re invited to join my Facebook group that is focused on the Narrative Lectionary text and sharing resources for studying each week. It is called Narrative Lectionarians.